• Self-Generated Vacuum Dynorbital Supreme includes low profile, premium urethane weight-mated sanding pad. Ready for connection to optional portable self-contained dust collection system. 3/32" (2.5 mm) diameter orbit. • Dynorbital Supreme models run at 12,000 RPM. Rotor utilizes five blades and produces more useable power. Composite rotor is stronger and has better lubricating qualities, enabling blades to last longer. • Composite base has integrated rubber over-mold creating a non-slip feel, as well as insulating from cold. The air motor is suspended by vibration-absorbing rubber rings (Patent No. 5,319,888) to minimize vibration. • Triple-sealed front double row balancer bearing (Patent No. 4,854,085) is guarded from sanding residue for long life and lower maintenance; easy replacement using 57098 Repair Kit. • Anti-clog design (Patent No. 5,319,888) enhances the vacuum pick-up on self-generated models. Dust particles are directed away from the air motor (reducing contamination) following a smoother, easier path of extraction. Comfort Platform provides additional hand and wrist support, further enhancing operator comfort. Also offers increased protection against cold air exhaust. (NOTE: Comfort Platform is removable.) Order 59330 Comfort Platform (U.S. Patent No. D610,428) separately, to install on existing tools! The Dynabrade 56853 5" (127 mm) Dia. Dynorbital Supreme Random Orbital Sander, Self-Generated Vacuum is a Dynabrade tool within the D3 Dynorbital Supreme category of tooling range. Coated abrasives and surface conditioning material Discs of 127mm can be used which can also be supplied by DynaShop. A Self-Generated tool with a maximum RPM of 12000, a power rating of 0.28 (209) with a weight of 0.93kgs. The Dynabrade 56853 5" (127 mm) Dia. 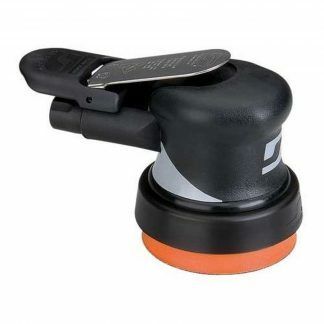 Dynorbital Supreme Random Orbital Sander, Self-Generated Vacuum has a Refined Ergonomic Tool Grip that allows for a more comfortable grip and feel, reducing operator fatigue and increasing efficiency. Perfectly-balanced, weight-mated sanding pad with exclusive single-piece hub design. Dynabrade premium urethane pads offer smoother operating performance and minimal vibration. To read our guide on choosing the correct Dynorbital please read here. Easy to mount and ensures optimum performance when used with the Dynabrade 56853 5" (127 mm) Dia. Dynorbital Supreme Random Orbital Sander, Self-Generated Vacuum. This new hook-face pad accepts all abrasive types (coated, film discs, mesh, etc.) and all abrasive hole configurations. Due to the transparent mesh/hook-face surface, it ensures a fast and easy positioning of the abrasive and guarantees efficient sanding process due to excellent dust extraction. Dynabrade exclusive one-piece hub design assures an extraordinary pad centering and balancing, while it is easily mounted on any Random Orbital Sander. Vibration is dramatically reduced and operator comfort increases, as well as the surface quality and vacuum efficiency on all materials. DynaMaze allows operators to work with only ONE back-up pad. The quick exchange of any abrasive reduces production time. It offers state-of-the-art vacuum technology, retaining all standard features of Dynabrade renowned pads. Please complete the form below to arrange a tool demonstration for the Dynabrade 56853 5" (127 mm) Dia. Dynorbital Supreme Random Orbital Sander, Self-Generated Vacuum or any of the Dynabrade range of tooling. Alternatively please call us on 01273 468736. Vibration readings for the Dynabrade 56853 5" (127 mm) Dia. Dynorbital Supreme Random Orbital Sander, Self-Generated Vacuum are dependent on a number of factors that include the abrasive being used, the job in hand and operator experience. DynaShop or Dynabrade cannot be held responsible for the consequences of using the listed values for risk assessment, rather than actual values unique to each situation. Simply fill out the form below and the vibration data for the Dynabrade 56853 5" (127 mm) Dia. Dynorbital Supreme Random Orbital Sander, Self-Generated Vacuum will be sent to your email automatically.